Notifications are obnoxious. Few of us actually need a “ding!” from our pocket every time we get a new email. But some emails are more important, and you might want to hear about them immediately with a notification. You may care a lot about an email from your boss, spouse, or even a lawyer. Rather than getting notifications for everything, set up notifications to only happen for critical emails you really care about. You can do this with the VIP email notification system added in iOS 7. This allows you to flag certain email addresses at “VIPs,” and you can enable email notifications for only those very important people. For example, your spouse, kids, and other family members could be VIPs, as could your boss and other important professional contacts. First, add people you care about to the VIP list. Open the mail app, locate an email from an important person, and tap their name. On the “Sender” pane, scroll down and tap Add to VIP. Emails from that person will now appear in your special VIP mailbox. Tap the “i” bubble to see a list of people on the list. To add more people to the list, tap Add VIP or just keep adding them from the inbox. 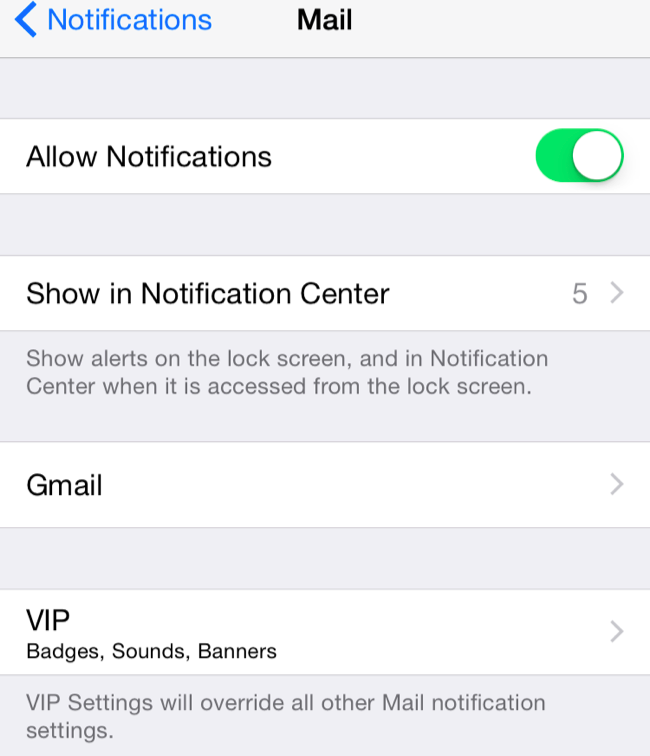 Tap VIP Alerts here to access the VIP notification settings. You can also access these from Settings > Notifications > Mail > VIP. Choose how you want to be notified about those VIP settings. You can then tap Mail at the top of the screen (or navigate to Settings > Notifications > Mail) and tap the name of your email account. 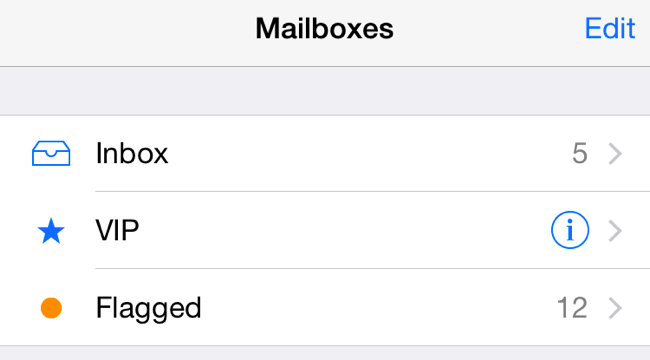 Disable notifications for those mailboxes and you won’t receive notifications when a typical email comes in. However, you will receive notifications when an email from a VIP comes in. The Mail app gained a new feature in iOS 8, allowing you to enable notifications for individual email threads. If you’re participating in an important discussion, you might want to set up notifications for that thread only. Or, you could have some sort of automated notification system that notifies you if your servers are on fire, and ensure it sends messages that end up in a specific thread. Activate notifications for that email thread and you’ll be in business. You can also use this to activate notifications for a specific email thread when sending the first email, ensuring you’ll be immediately notified when someone replies to that specific email. To do this, start sending an email in the Mail app — an email that starts an entirely new thread, or a new email in an existing thread. 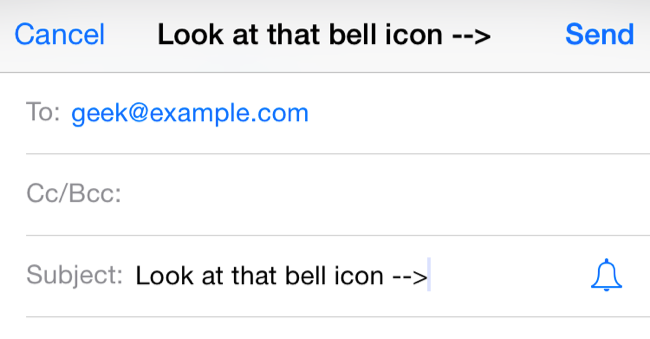 Tap the bell icon to the right of the subject field. Tap the “Notify Me” option to enable notifications for that specific message thread. The bell will turn a solid blue color to indicate notifications are enabled for that email thread. 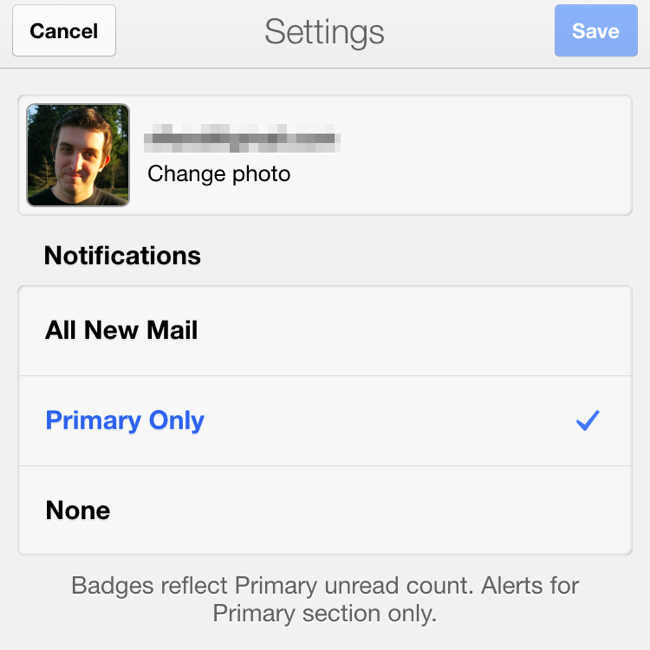 The Gmail app on iOS only offers three different notification preferences. There’s “All Mail,” “Primary Only,” and “None.” So, if you set up Gmail to use the tabs system — that’s the “Default” inbox type in Gmail’s Settings page on the web — and then carefully categorize your email so that the important emails you care about appear under Primary, you’ll get more relevant email notifications. We’re not huge fans of the tabbed inbox system Google is pushing, though. This is by far the least powerful way to get only the important email notifications, so you’ll probably want to turn to the below app. 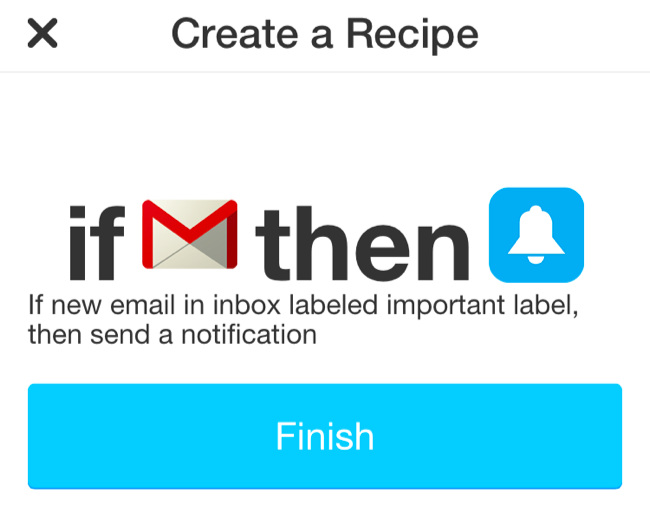 To most closely approximate our Android advice on an iPhone, you could use IFTTT. Let’s say you’re using Gmail — you can use the Gmail web interface to set up filters that automatically classify emails you care about with a specific label when they arrive. Next, install the IFTTT app and set up a Trigger that happens when an email arrives in that Gmail label. Tie it an an action that creates a Push Notification on your iPhone and you’ll get the notifications you want. You can then disable the notifications for your email app, leaving them enabled for the IFTTT app. This isn’t as nicely integrated in one place as it is on the Gmail app for Android. But, for most average users, the quick VIP notification system and email thread notification toggle will be easier to use and discover than the complex label-notification rules on Android. For users who want more power, there’s always IFTTT.